Silchar, Mar 11 : In a fallout of the boundary dispute between Assam and Mizoram, suspected Mizo miscreants on Saturday night blew up an Assam government-run lower primary school at remote Kachurthal village near the interstate border under Katlicherra block of Hailakandi district. A senior police officer said two RCC buildings of Muliala LP School were completely damaged in the blast, triggered by suspected Mizoram-based miscreants. However, there was no report of any loss of life as the blast took place about 11.30pm. The miscreants used explosive materials meant for blasting rocks to carry out the blast, said the officer. The school, located near the Mizoram border, was hit by a similar blast triggered by miscreants last year, causing damage to the building. The state government later reconstructed the school under the Sarva Shiksha Abhiyan. Soon after the blast, police and CRPF men from the nearby Ramnathpur police station rushed to the spot and launched an operation to nab the culprits. Cops and locals helped douse the fire caused by the blast. However, no arrests were made till Sunday evening. Deputy commissioner (Hailakandi) J Balaji and SP Brojenjit Sinha visited the blast spot, 140km from here, on Sunday noon to take stock of the situation. Investigation is on to nab those responsible. Sources said boundary dispute between the neighbouring states has been a contentious issue for the past many years. In 2007, Mizos formally claimed that Kachurthal village, an area 7km inside Hailakandi under the Assam forest department, is within the boundary of Mizoram. They were opposed to construction of the LP school in question by Assam government. 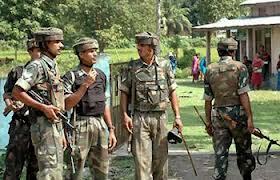 Assam Police and CRPF intensified vigil along the Mizoram border following Saturday night's incident. Assam and Mizoram share a 119-km interstate border—Hailakandi district shares 80 km and Cachar district 39 km. According to the state minister for border area development, Siddeq Ahmed, Mizoram has grabbed 1,000 hectare of Assam land over the years. Assamese villagers living in the area said Mizo miscreants collect 'taxes' from the villagers living in the Assam area, and if they fail to pay, the Mizo miscreants take away their belongings. In 2006, Mizo miscreants dismantled an autorickshaw stand belonging Assamese owners which was well inside Assam territory near Virengti. In April 2005, an armed mob from Mizoram had torched at least 18 houses at Kanglei Punjee and Twipra Punjee villages in Cachar. In December of the same year, Mizo miscreants torched two Assam forest department's watch towers at Kachurthal. After it was reconstructed, they once again blew up a forest department watchtower at Kachurthal in 2009. Earlier in 2004, the Mizoram government demolished an Assam Police camp in Gollacherra forest, which they said was on the wrong side of the border. The border dispute is a result of a disagreement on the notifications issued under the Bengal Eastern Frontier Regulations, 1873, and the clarification of Inner-line Reserved Forests on the border areas between the two states.